Our Occupational Health & Safety Department provides support in all aspects of health and safety relating to field and administrative operations. We are committed to ensuring the health and wellbeing of the public, the environment and all Dufferin Construction Company employees, subcontractors and our suppliers. 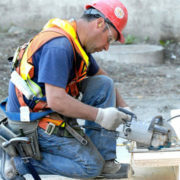 At Dufferin Constructions our core value is the health and safety of our employees and the public. Our culture is one where all employees are aware that their health and safety is of our highest concern and a condition of employment. To support this we have implemented a robust Occupational Health and Safety (OH&S) Management System that provides management and employees with the structure and programs required to meet our core value of ensuring a safe and healthy workplace. Dufferin Construction has achieved a Certificate of Recognition (COR) through the Infrastructure Health and Safety Association (IHSA) since 2013. Dufferin is externally audited annually by the IHSA. Developed and modeled after the OH&S 18001 guidelines. 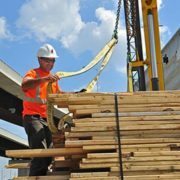 At Dufferin Construction we strive to ensure we have a work culture founded on working safely. Our Senior management team fully supports this concept and is committed to ensuring the safety of all employees at the company. Their safety values are cascaded down to every worker in the company and promote having an overall safety mindset on every task completed. In 2008, Dufferin Construction began a change program. We believe that management commitment is the key to success and we ensure that our employees are well-equipped with the knowledge that they need. The objective of the Safety Culture Program is to achieve safety excellence through the involvement of all employees. 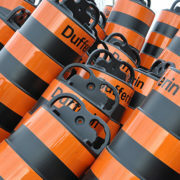 Safety is a condition of employment at Dufferin Construction. Safety Culture is based on behaviours which are beliefs, assumptions and norms also known as “unwritten codes of behaviour”. The Safety Culture Program involves front-line hourly workers surfacing issues and empowering the group to brainstorm and collectively work toward reducing risk of injury to all. Dufferin Construction has won three Golden Eagle Awards. The award is given to a CRH Americas Materials (AMAT) company for achieving 1 million hours worked without a Lost Time Injury. The award is presented by the Vice President of Health and Safety and Environment and President of CRH Americas Materials. 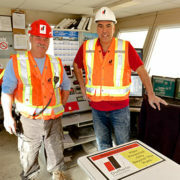 Established in 2006, the CRH Canada’s President’s Awards for OHS Excellence was first introduced to recognize contributions employees have made throughout the year to improve safety at the workplace. 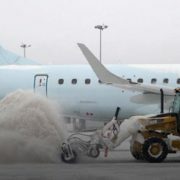 Most recently Dufferin Construction were named winners of the Bronze and Silver Awards for developing a Rock Truck Training Video and also implementing a Back-up Awareness Radar Detection system to prevent struck by incidents at the Greater Toronto Airport Authority. Halton Construction Association (HHCA) recognized Dufferin Construction on February 19, 2015 at their Annual General Meeting Dinner and Awards celebrating their 95th year anniversary. The safety award recognizes HHCA Contractor members for their excellence in six (6) different OHS categories. Dufferin Construction won in Category 1 – 500,000 man hours and over average hours worked. Dufferin Construction has participated in the HHCA award nomination program for several years. Companies who wish to participate must submit to a third party external safety audit conducted by the Infrastructure Health and Safety Association (IHSA). Dufferin Construction, has participated in the external audit program since 2000. The combination of the Company’s WSIB rating (lost time injury rate) and the external audit score determine the winners of member firms belonging to the HHCA and who have worked more than 100,000 man hours. Dufferin Construction developed and implemented an OH&S management system that models the OHSAS 18001 standard. The program’s success was based on the external audit score of 100% and the substantial reduction in injury rates since the program was introduced in 2005. The first award, the 2000 Gordon M. Vipond Memorial Award, was established to honour a company who has demonstrated achievements and commitments in the pursuit of safety in the construction workplace across Canada. Initiated this year, this award recognizes Dufferin Construction’s significant accomplishment in providing training to some 575 employees in over 25 different construction related topics. 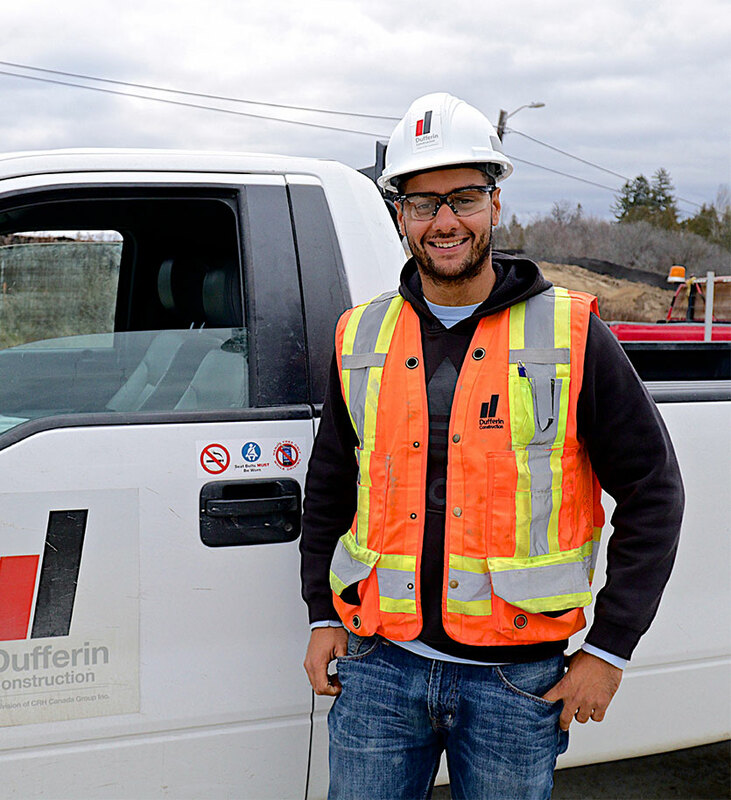 Dufferin’s Health and Safety department led the industry by updating its current training program to reflect the amendments made to the Regulations for Construction Projects, adopted in June 2000 by the Ontario government. Dufferin Construction Company was proud to receive the National Safety Award in 2005. This award that was presented to Dufferin in recognition of company’s comprehensive 23 point, safety program. 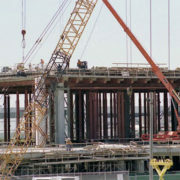 2003 Ontario Concrete Award under the Specialty Concrete Applications category for their innovative Hi-Load Shoring System, which was featured on the elevated frontage roads project located at Pearson International Airport in Toronto. 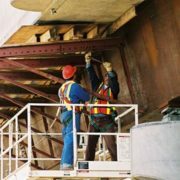 The use of a Hi-Load Shoring System has proven to be 50% more efficient than the conventional scaffold systems, thereby reducing costs. This system has also accelerated the overall construction schedule at this project. Similar to the HHCA safety awards, the HAND Association also recognizes member firms who have achieved the highest rated external audit score facilitated by the IHSA and who have reduced their WSIB Lost Time injury frequency rate compared to other companies working over 100,000 man hours. Dufferin Construction has won the HAND safety award numerous times and continues to promote all member firms to strive for safety excellence. We are happy to offer our extensive expertise to help develop solutions for you. Please view our technical documents and information sheets below and contact us if you require any additional information or to obtain a quote.